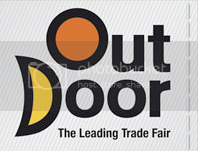 The OutDoor trade fair in Friedrichshafen is over, and more and more news are popping up for those which weren't able to attend. Odoo.tv covers the Fair in videos which are very worth viewing, even if you don't speak German. Video is the medium of the internet, and it is great to see some of the tents, sleeping bags and other equipment in living pictures. Roman aka Lighthiker also presented already a few interesting posts about new goodies, his Tent article shouldn't be missed. hrXXL also was at the OutDoor, and is reporting about the new Inov-8 Roclite 288 GTX as well as tents and other goodies. Hit the British flag on the top right to read his blog in English. All of the above surely will keep the posts coming during this week, and will inform us what's new and hot for the UL aficionado. So add them to your bookmarks and let them know that you appreciate their efforts! My thanks go out to these great folks for keeping us, who weren't able to make the trip to Friedrichshafen, up-to-date. Arigato.